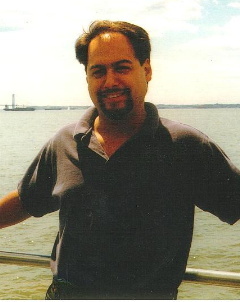 Our son, Gabino George Venegas, 34, was killed by a hit and run driver on January 14, 1998. A car struck our son from behind as he rode his bike home from work in the southbound lane of Highway 313 in Sandoval County, New Mexico. This location is situated on Sandia Pueblo, but jurisdiction was given to the New Mexico State Police. We are writing Gabino’s story for others to read because we want them to understand that when tragedy struck our family we had full confidence and trust in law enforcement. We believed that the New Mexico State Police would be required by law to do their job and investigate our son’s death. We were overwhelmed when we learned that a year and months had gone by and almost nothing had been done. We have tried to be open and to continue without bitterness, because that was the essence of our son’s soul. We want to continue to honor him and see that justice is done. All children deserve justice. We are not just speaking of an individual life or even in terms of a larger body of people. The process must reflect our humanity. It is in this spirit that this document is written. My wife and I were living in the Boston area at the time of the accident and were informed by our daughter who lives in Albuquerque, NM. The accident happened on a Wednesday evening. The police did not contact our daughter until the following day, although she is listed in the phone book. At that time, the statement that the police officer made to our daughter was that he was concerned about her "angry response" to this news. No consolation was offered outside of that cold remark. Due to a severe New England snowstorm we were delayed for several days from getting to Albuquerque. On or about January 17, at 8:30 p.m., State Police Patrolman Dan Lichtenberger called us at our home. He focused his conversation on why our son was on that particular road and questioned our son’s motives for being on that highway after dark, (despite the fact that the roadway is posted with signs alerting motorists to the possible presence of bicyclists). The call was insensitive toward what had happened to our son and to our concern about why the driver had not stopped to help. It appeared to us that Officer Lichtenberger had only one thing in mind – to go on record that he made the call to us. He provided little to no new information regarding the accident. Believing in the law and that the police were in place to solve our son’s case, I asked our daughter to stay close to the State Police to find out what had happened and what was going to be done to find the hit and run driver. Our daughter got no cooperation or respect from the State Police. Their tactics were intimidating and demoralizing to a devastated young woman who had just lost her brother. They gave no satisfactory answers and showed no compassion for our daughter’s situation. Our daughter, like many children, was brought up to believe that a law enforcement officer was an honest, law abiding citizen who cared about the people he/she served and protected. My entire family, because of our experience, is now questioning this belief. Our daughter then wrote a letter to Senator Domenici, for whom I had worked at one time. The senator did not respond directly, but he apparently forwarded the letter to the local authorities, because sometime later our daughter received a very intimidating phone call from the State Police. She was given a lecture and an indirect threat regarding her contact with Senator Domenici. I also received a phone call from patrolman Dan Lichtenberger telling me that my daughter was getting in the way of the investigation. Fearing the worst, my family and I decided to contract a lawyer to oversee the investigation and get to the truth. We were saddened by what our daughter was put through, although we knew that she gladly did what she could. It appeared that, in the view of the State Police, she was now a threat. At our lawyer’s suggestion, we hired a private detective. In a very short period of time we received more detailed information regarding our son’s hit and run accident than we had received from the State Police. We learned that three witnesses came upon the scene immediately after the impact. The witnesses were in separate vehicles, all traveling northbound, and before reaching the spot in the road where Gabino lay, were passed by two vehicles driving at high speed in the southbound lane. The first was a law enforcement vehicle, (one witness thought it was a sheriff’s car), and the second vehicle, which was about a half mile behind the first, was a small, white hatchback. The witnesses reported seeing the hatchback swerve around Gabino. All three initially thought the hatchback was traveling around a dog or other animal, but once they got up close they could tell it was a person. They, then, U-turned and blocked Gabino's location so no other cars could hit him. Gabino came to rest about 135 feet from where the apparent point of impact occurred. Based upon the eye-witness accounts, our investigator surmised that the force of impact from the first car propelled Gabino forward, and that the car that attempted to swerve past him struck him as well. We had to get a court order before the State Police would allow our investigator to review the physical evidence left at the scene, which the police had neglected to send to the forensic lab for testing. When our investigator was finally allowed to examine this evidence, he was able to match the second vehicle to a 1982-83 Toyota Supra. NMSP had never tested the bicycle, which had paint transfer on it, although State Police Officer Art Ortiz assured us they had. Officer Ortiz also lied to us about interviewing a witness that he had never actually located. Our P.I. submitted a request for an MVD printout of the 113 ‘82 and ‘83 Toyota Supras in the two county area between Sandoval and Bernalillo. We were willing to pay him to inspect every car on that list. Although he made the request legally under state law to investigate an auto accident, NMSP ordered the head of the Motor Vehicles Department, (a former state cop), to deny us that information. The possibility of a law enforcement vehicle being involved was apparently an issue that put the police on the defensive. Their behavior and attitude were not of cooperation, but of putting up barriers. It appeared to us that the police were no longer interested in solving our son’s case. Our lawyer attempted to defuse their perception that we were somehow a "threat" by making it very clear, up front, that we had no desire to implicate the State Police and that we had no intention of suing anybody. We were only after the truth and the identification of our son’s hit and run suspect. On January 28, upon hearing the allegation that a sheriff’s vehicle might have been involved, the Sandoval County Sheriff had ordered an inspection of all sheriff’s vehicles. Two of those cars displayed damage, allegedly acquired prior to our son’s fatal accident. Officer Art Ortiz reportedly inspected the damage on those vehicles and was confident that neither had struck Gabino. Our attorney requested copies of Officer Ortiz’s reports, but the police were unable to find them. Our attorney filed a tort claim notice against NMSP, as she suspected they were covering for a fellow cop. Then, she and our investigator met with Officer Art Ortiz, Patrolman Lichtenberger, and an attorney for the Department of Public Safety, who announced they would not share any information with us unless the tort claim notice was withdrawn. Our attorney withdrew the notice, but the police still refused to share their information, although our investigator readily gave them all of ours. At this meeting, all parties agreed on a list of investigative actions that the State Police would now take. That list was sent to us for review, and we felt satisfied that progress was being made. We were learning that the grieving process included the confusion and weariness that saps energy and prevents one from thinking in an orderly manner. Following that meeting, our lawyer and investigator were led to believe that the police were doing everything that had been agreed upon. In fact, I received one letter from our lawyer telling us that she believed that the police were giving our son’s case some serious consideration and a lot of time and that there was sincere concern about the loss of our son. In the meantime, we had moved to Mexico City due to my job. Being out of the country, we had no choice but to trust our lawyer, investigator, and most of all, the authorities, to do their job and to do what they said they would do. We had confidence in our law enforcement and believed in what they told us they would do. Months later we were devastated to learn that the State Police were doing nothing to solve Gabino’s case. The list of investigative actions had been set aside and the case was now in the State Police’s unsolved case file. The police had not done any of the things they had previously agreed to. The silence and feeling of rejection that emanates from such inaction is heart breaking. I personally have not heard one word from any of the police officers assigned to Gabino’s case. Compassion, even if impersonal, was and is today completely absent. There is a pattern of defensiveness that is certainly not appropriate. Compassion for life appears to have no meaning to these people. We have done nothing wrong except to ask the questions that any parent would ask when losing a child. Everyday we ask ourselves so many questions as to why this happened and why the State Police have not done what they said they would do, thoroughly and with the skill that they were trained to use. Their integrity is being called into question. If they are under-staffed, why do they continue to ignore our legal adviser’s and investigator’s offers to help? Why this lack of collaboration? From then until the present time there is this person who was directly responsible for the loss of a life, who is silently going ahead with his own concerns and life. This is a disgrace to a justice system that claims to serve the people of New Mexico. Prior to moving from Boston to Mexico, we were advised by many that it would not be safe for us to live there. People in Mexico live in fear of their law enforcement. They do not trust the police, and when something happens they don’t even report it because of the ineptitude and corruption surrounding their justice system. Our embassy in Mexico City advises Americans not to call the police if they need help. Instead, they tell us to call "watch dog" organizations. Because of our painful experience with the New Mexico State Police, we now can see little difference between the two systems and have lost confidence in our law enforcement system as well. The loss of our son continues to be a most difficult cross to bear, and as long as the "Doors of Justice" remain closed to us, healing will be impossible.